This is the type of ecosystem that Californians most associate with their state– gentle grassy savannas bordered with live oak. There’s much more, though, including brushy coast ranges and dramatic cliffs and deep forested canyons that define much of the coast. The Central Coast bioregion has a wide variety of habitats and vegetation, including coastal prairie scrub, mixed hardwoods, and valley oaks on the rolling hills and mountains that descend to the ocean. In Santa Cruz County there are redwood forests. Farther to the south are oak woodlands and chaparral. San Francisco Bay is home to coastal salt marshes, while both freshwater and brackish marshes in the Delta provide crucial wintering spots for migrating birds. These marshes offer pickleweed, great bulrush, saltbush and cattail. 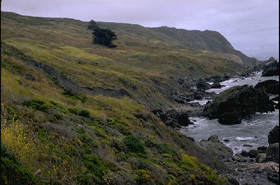 Eucalyptus, manzanita, northern coastal scrub, California buttercups and goldfields populate the bioregion. Rare plants: Marin western flax and Point Reyes checkerbloom. Endangered plants: Tiberon mariposa lily, Baker’s manzanita and Sonoma sunshine. The temperatures in this Mediterranean climate don’t vary much with the seasons. The northern coast (which includes San Francisco) experiences relatively cool, often foggy summers, mild falls, and chilly, rainy winters. Farther inland, hot, dry summers and warm autumns are followed by mild, wet winters. Snowfall is rare. The area to the south (encompassing the cities of San Luis Obispo and Santa Barbara) is characterized by a mild, sometimes foggy climate. This makes for rich farmland and vineyards. The Central Coast bioregion is one of the most populous in California– it encompasses the San Francisco Bay Area, the Sacramento-San Joaquin River Delta and the farmlands south of them. The geography of the bioregion is varied. It features coastal mountains including the Santa Lucia and Santa Ynez ranges, with several peaks rising above 3,000 feet– including Mt. Diablo at 3,849 feet. Near the ocean lie sand dunes and gently rolling hills, the latter providing grazing for wild and domestic animals including dairy cattle. 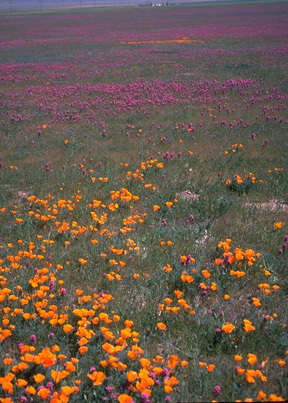 The Los Padres National Forest covers much of the southern part of the Central Coast bioregion. The Salinas and Cuyama rivers feed two major watersheds. Soquel Demonstration State Forest, near Santa Cruz, provides an example of sustainable logging. Wetlands in the Central Coast bioregion, both brackish and freshwater, provide the single-most important migratory stopover for waterfowl between Mexico and Alaska. Birds include canvasback, western grebe, black-crowned night heron, great egret, snowy egret, white pelican, gull, acorn woodpecker, golden eagle, western bluebird, Caspian tern, American avocet and cedar waxwing. 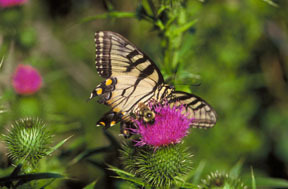 Other wildlife found throughout the region includes grey fox, mule deer, bobcat, raccoon, Pacific tree frog and swallowtail and painted lady butterflies. Harbor seal, sea lion, leopard shark and bat ray are just a few of the species that make the region’s marine wildlife among the most diverse in the world. Threatened and endangered species: California least tern, California black rail and clapper rail, California brown pelican, Smith’s blue butterfly, salt marsh harvest mouse, California freshwater shrimp, northwestern pond turtle, tidewater goby and Chinook salmon. Development– Because the area is so heavily populated, development is a major issue in the Central Coast bioregion. Housing and commercial developments are continually eating up fast-disappearing open space and precious habitat. Water– The Central Coast bioregion is the focus of a great debate over conflicting demands for the water that flows through the Delta. Two-thirds of the state's residents receive at least a portion of their drinking water from the Delta.